Gilbert is One Hell of a Prankster! 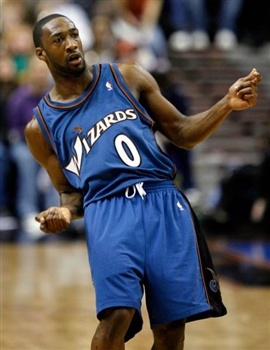 One of my favorite players in the NBA, Gilbert Arenas, has been all over the news because he pulled a gun on his teammate, Jarvis Critteron reportedly over a gambling debt. I dunno if I believe that story, but something obviously went down considering they met with police today. I find it comical that Gilbert would be THAT angry over a gambling debt when he’s in his third year of a $111 million dollar contract! BUT, a ridiculous amount of athlete’s live outside their means, and Gilbert could be no different. Who knows, maybe he lost a few pay checks to Critteron playing cards, and pulled a gun on him to get his money back. Sounds very plausible. I’m thinking he has more common sense than that. Gil hasn’t been nearly as active on his blog as he used to be in the past, and has been far less of a showman this season on the court. I’m sure being on a losing team has something to do with it, but he was more outgoing a couple of years ago to the media. I guess I buy the most recent story that he was pulling a prank on Critteron. Since he spoke to police, they allowed him to clear it up. Honestly, it’s not a big deal to me if he didn’t have them loaded, and used them as a joke. Also, a side thought on DC, I hear it’s pretty ghetto around there, so maybe guys do need some guns around to protect those Bentley’s when they leave the arena. Either way, I love some of the reactions that players around the league had!